In an industry lousy with third-person shooters, Sega’s Binary Domain poses a simple question: What if you actually cared about the people you shared cover with? Or, more importantly, what if your squadmates could formulate opinions of you, the player, based on how you treated them? The result of this thought experiment is the futuristic shooter Binary Domain. While it may not flawlessly implement many of its ideas, it rises above being yet another Gears of War clone. By the year 2080, life as we know it is virtually unrecognizable. Years earlier, much of the world was flooded, leaving major cities across the globe as little more than waterlogged ruins. This disaster scenario was a perfect time to reap advancements made in robotics. Thanks to their tireless work ethic, our metallic friends were able to rebuild much of society anew. This relationship has been tested with the advent of so-called Hollow Children. These robotic variants have suddenly emerged thanks to a violent, high-profile incident leaving world leaders at a loss on how to deal with them. Not only are the flesh-covered Hollow Children visually indistinguishable from humans, but in a Blade Runner-inspired twist, implanted memories have left them thinking that they’re human as well. Now Dan Marshall and a group of multinational soldiers have to infiltrate Tokyo and seize Yohji Amada, head of the Amada Corporation. The international community believes Amada is responsible for the Hollow Child phenomenon—a violation of 2040’s New Geneva Convention—and wants him to face trial. Along the way, Marshall and his buddy Roy "Big Bo" Boateng will get to know a new group of elite soldiers, and together they’ll reduce countless robots to sparking scrap. Of course, you can’t have a shooter without a few gimmicks. 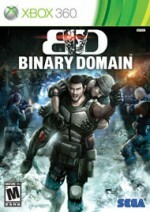 Binary Domain delivers a pair of them, in the form of AI trust and a speech-recognition system. They’re both interesting ideas, but neither one of them works as well in practice as they might have conceptually. Fortunately, the game’s strengths provide at least some degree of distraction when things invariably fall apart. First up is the trust system. Your squadmates’ opinions of you are malleable, and they change depending on a variety of factors. Being the elite soldiers that they are, performing well in combat by knocking out a few headshots or blasting multiple bots apart with a single attack is one sure-fire way to impress them. Likewise, playing up to their personalities in dialogue-heavy sequences is another way to get on their good sides. Hit one of them with an errant shot or send them into harm’s way unnecessarily and their feelings on you will dip. Before you think we’re approaching dating-sim territory, know that this all has a gameplay purpose. Characters who think highly of you are more effective in combat. Butter up the icy MI-6 operative Rachel, and she’s more likely to fire off a helpful RPG round. Maintain a good relationship with Big Bo, and he’ll practically beg to blitz enemy positions with his SAW. When you’re not on great terms, characters will complain about your requests, eventually becoming straight-up insubordinate. It’s certainly an intriguing idea, but the trust system doesn’t deliver in practice. The most glaring issue comes with the AI itself. While characters do a remarkable job of healing fallen teammates and aggressively attacking robotic enemies, they also seem to be absolutely fascinated with standing in front of your targeting reticule during firefights. I don’t know how many times I had to endure a lecture from French teammate Cain about the nature of friendly fire, but I do know that each and every time it was because he casually sauntered between my assault rifle and a robot’s face. Another problem is directly tied to the game’s abysmal voice recognition. Players can use a headset (or Kinect on the Xbox 360) to verbally interact with their team. You can then switch tactics or prioritize actions by using a variety of short phrases. The problem is, it doesn’t work. Here are a few of the words that Binary Domain had a difficult time recognizing during my playthrough: “No.” “Affirmative.” “I can’t.” Making matters worse, those words were interpreted as (in order): “Sure.” “Negative.” “Yeah.” In a game that forces you to engage in conversations with your squad at regular intervals, you can imagine how this is a problem. It’s made even worse when their opinions can change depending on whether you’re actually requesting a revive or declining one for tactical reasons. Curiously, Kinect’s microphone apparently picked up in-game sounds, which led to characters giving me nonsensical responses to questions and orders that I never issued. Fortunately, the core of the real action is precise, addicting, and fun. The rank and file humanoid robots that stand between your team and its goal can be dismantled in a variety of interesting ways. Take out their legs, and their sprinting attacks are obviously slowed; instead, they advance by clawing their way toward you in a creepy dragging animation. A few shots to an arm, and you can blast it off, nearly eliminating a bot’s threat. My favorite method was to pick off their heads and have a robot’s out-of-control remains fight its buddies for a short time. Thanks to the precise gunplay, which doesn’t over rely on auto-aim, I was able to amass small armies during battles, albeit temporarily. Binary Domain is well-paced, too. It seems that there’s always something new and exciting to break up the action. Bosses take on familiar animal and insectoid forms, but their attacks (and the tactics you’ll need to use to take them down) feel fresh. You’ll have to do more than blast at the glowing spots to scrap most of these bigger enemies. Expect to scamper up tentacles to line up a perfect shot or set up an explosive trap for a marauding behemoth. I never felt overwhelmed or underpowered, thanks to a steady stream of weapon and character upgrades. Though shoddy voice recognition often undermined our relationships, I did grow fond of Binary Domain’s characters. They’re a likable bunch, and the game is surprisingly low on military grunt stereotyping. The same goes for the overall plot. All that back story wasn’t wasted; there’s a sense of urgency that drives the whole production. Even though it’s a game that’s essentially about blowing up robots, the story is quite good and raises some interesting points about progress and humanity. While I saw the concluding twist coming, I doubt that anyone will be able to deduce how the story arrives at that moment. Multiplayer is completely functional and absolutely forgettable. Aside from references to stealing data and a rebellion, it may as well have come from an unrelated universe. It’s a shame, too, considering how interesting Binary Domain’s setting is. I enjoyed my time with the game, and I can see it grabbing a rabid cult audience. I’d recommend it to anyone who can relax their expectations a bit, particularly when it comes to the voice recognition. The more you’re able to focus on where it succeeds and look past its obvious failings, the better. While it may not flawlessly implement many of its ideas, Binary Domain rises above being yet another Gears of War clone.